Since my season in Escalante I have always heard that the best time of year to go to Bryce Canyon is during the winter, so a few friends and I loaded up and headed that way to check it out. The NOAA weather forecast was for at least one sunny day out of the weekend. Since the huge views are what Bryce is all about we were hoping the weather forecast was correct. Our plan was to leave Ogden about 3am so we could still get a full day on skis. We'd meet in Panguitch around 9am (which was fogged in) then drive through Red Canyon (also fogged in). I'd heard the skiing could be good in Red Canyon so we thought it'd be worth a look also. Usually before a trip I would fire up the ol' internet and see what people have to say about an area. The funny thing about this trip is that I couldn't really find any info, other than snowshoeing, about where we wanted to go, and as any back-country skier will tell you; snowshoeing is dumb. So I guess we were pioneers in a sense, and the back-country skiers point-of-view is on the ol' interweb now! Trying to score turns in this terrain is something that takes a bit of work in studying the country, maybe a whole trips worth of "work". Anyway, we stopped in Red Canyon on the roadside for a quick look and decided there was definitely enough snowpack to ski it. Since it was in the fog we decided to go on up to Bryce, hoping to get above the fog. We stopped into Rubys Inn where Ray had reserved us a room for an unbelievable rate of $117 bucks for four people for two nights. There was even a hot tub complete with Germans! Our room wasn't yet available so we found a dry spot on the back parking lot to change clothes and junkpile all our stuff into Rays car. We then took Angela's car into the park where we were pleased to break above the fog. We had amazing views from the rim to the west and could see down on top of the fog to the north towards Rubys Inn. 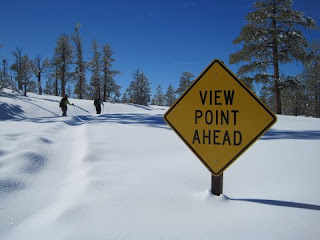 We decided to park at Parias View trailhead and tour around the rim to the south, then cross-country about a mile through the ponderosa pine forest to a different rim, where we'd sit in the sun and marvel at the view. We could see all the way to Navajo Mtn. and Fiftymile Mtn. We spent most of the rest of the day out there then headed back toward the trailhead. We found a few turns on the way back, above the rim of course. Apparently it's illegal for skiers to go below the rim. It would've been quite difficult to drop the rim anyway, and the slide potential was too dangerous, besides we didn't want a ticket. On the drive from Parias View to Rubys Inn we stopped off at Inspiration Point for, what else, the view. From the parking area we walked up the trail and around the corner, where there before us was the moon rising above Powell Point, with the last of the suns glow on the cliffs below. It was truly an inspiring scene of visionary enchantment, and an amazing ending to the day. The next day we awoke to the fog so we figured we'd go back into Red Canyon and give it a try. We hiked what we'd named Oak Leaf Canyon because of it's resemblance of such on the topographic map. It is the boxed canyon directly south of the campground. We started up the canyon and immediately knew the snowpack was spooky. On flat ground it would make the distinct "whoomping" sound. We hiked about a mile to the head of the box where everything got steep. We thought we'd test out some different aspects to see if the same dangerous circumstances existed. It did so we decided it was still early enough in the day to try out a different area. We drove to the east side of the park where some interesting terrain revealed itself to us. Ski it we did, getting back at the car as darkness fell. It is always neat feeling to start early and finish late. Makes me feel like I've gotten my money worth out of a day, makes the beer taste good too. Sunday morning was again fogged in at Ruby's Inn. I felt for the funny Germans at the desk bitching to the clerk about the fog blocking their view off the rim. We moved out early thinking we'd go up through Cedar Breaks on the way home. Just a few miles from Ruby's we broke out of the fog and had clear bluebird skies all the way home. Cedar Breaks access was pretty easy from the plowed road near Brian Head at 10,000 feet. We hiked south a half mile or so where we scoped out some amazing skiing on some steep terrain below the rim. The line we wanted is below the orange cliffs in the center/left of the picture below. It was a challenging and fun puzzle to figure out how to drop the lines we wanted because of the thick forest and cliff bands that concealed the access. We finally got into the right gulch that gave us access below, and around the cliffs to the left, to the top of the line we wanted. Ray and I traversed out to the top of the line, but found some deep wind deposition below the cliffs on some 40 degree terrain. It was heart-breaking to not ski it, especially after we'd put so much work into figuring it out. We pretty much chickened out; just a gut feeling that was bad. Besides we still had to drive 300 miles home that night. We left Cedar Breaks and started the long drive. We stopped into Meadow Hotsprings on the way home where the star filled sky was the perfect ending to an amazing weekend trip. waaaahoooo!!!! what a fabulous trip!!!! thanks for sharing the photos and I look forward to visiting with you in AK.... keep up the good work!!! !